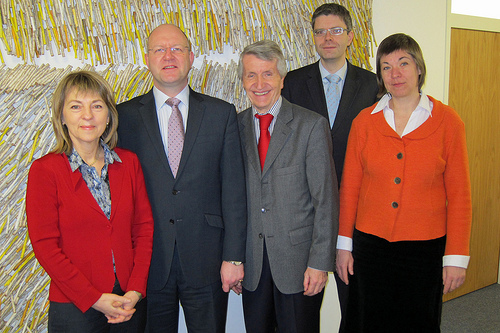 Pictured here is Prof Jenny Hamilton, Simon Askey, President of Passau University Professor Walter Schweitzer, Vice President for International Affairs Professor Wolfgang Hau and Dean of Faculty Ulrike Muessig. On Monday 30th January Professor Jenny Hamilton, Director, and Mr Simon Askey, Deputy Director, visited Passau University where they signed an agreement between the University of Passau and the University of London International Academy whereby students following both the Passau law programme and the University of London International programmes LLB will be able to benefit from a special and specific arrangement which will allow certain credits obtained on one programme to be recognised for the purposes of the other. Although it was very cold day (though not as cold as the next day but one where temperatures fell to -25 degrees), Jenny and Simon were able to tour Passau University and its excellent facilities as well as to meet with students on the University of London International Programmes Diploma and LLB programmes.